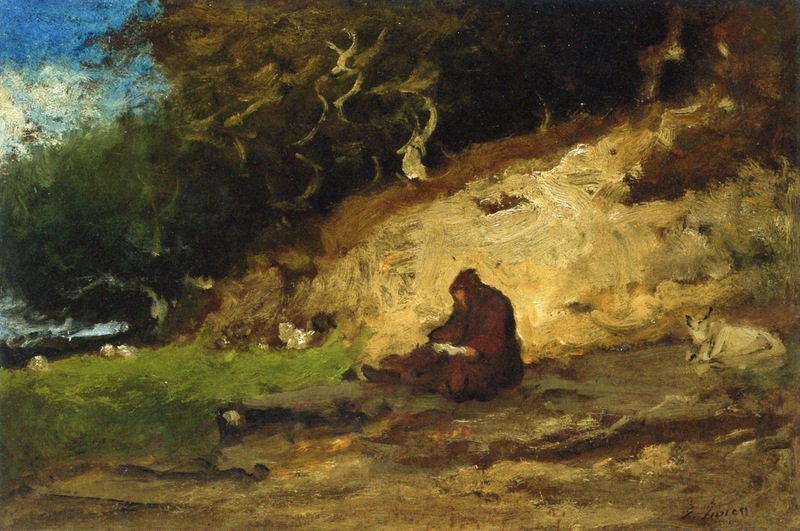 The Hermit, c. 1883, oil on board, by American artist George Inness (1825–1894). Image courtesy of The Athenaeum. The story of a man, cold and hard-hearted, and acknowledging no brotherhood with mankind. . . . Then the body would petrify; and he having died in some characteristic act and expression, he would seem, through endless ages of death, to repel society as in life, and no one would be buried in that tomb forever. Hawthorne transformed this vague notion into “The Man of Adamant”—although readers will find it changed a bit from his original concept—and it appeared in the 1837 holiday gift annual The Token and Atlantic Souvenir, for which he had been writing tales for several years. That year’s collection actually contained eight selections by Hawthorne—and he received a mere $108 for the entire lot. Notes: There are several biblical references in the story. Kedar is the name for a nomadic confederation of Arab tribes mentioned in several books of the Old Testament. To “dwell in the tents of Kedar” was to be isolated from the worship of God (see Psalms 120:5). Elijah's cave at Horeb refers to his hideaway after Jezebel threatened revenge for killing the prophets of Baal (1 Kings 19:1–8). Abraham’s sepulchral cave at Machpelah, also known as the Cave of the Patriarchs, is the famed subterranean burial plot in Hebron (Genesis 23:17–19). In the old times of religious gloom and intolerance, lived Richard Digby, the gloomiest and most intolerant of a stern brotherhood. . . . If you don't see the full selection below, click here (PDF) or click here (Google Docs) to read it—free!